Barnet Council Supplier Payments It's nice to see old friends! Barnet Council have just released the April supplier payments. A few payments stand out this month as being particularly large. The Barnet Group, the local authority trading company for Barnet Council's housing and social care services received £9,631,916.60. Now I am sure all of that money is warranted but it is a great shame that it falls outside the scrutiny of the council. Logica submitted only 6 invoices but they amounted to £1,135,786.30. I wonder what that was for, possibly for the continuing work on the wonderfully expensive SAP system. I also came across a supplier called Hurria. Not recognising this company I looked up the company director on line who was named as one Irene Paterson-Hesford. Formed in September last year this is a very new company which always raises suspicions. Anyway, the power of the internet reveals that Mrs Paterson-Hesford is none other than Irene Findlay, formerly Director of Health Integration and Director of Adult Social Services at London Borough of Barnet. Ms Findlay is an Executive Coach so clearly the senior managers at North London Business Park were missing her. The invoice is for a very modest £4,000 but it would be fascinating to know which of the highly paid Barnet Council executive felt the need to employ her services. Further analysis of the supplier payments will, I'm sure reveal a few more gems but I will leave that for another day! Tomorrow is a by election in Brunswick Park ward of Barnet.The voters of that ward are fortunate in that they hold a great deal of power. This by-election is as much about people's satisfaction with the way Conservatives run Barnet as it is to vote for a new Councillor. Promises have been made that the Conservatives will reconsider parking. Frankly, the initial comments coming out suggest that the changes will be minor and will fail to address the fundamental issue that parking is just too expensive. Will they re-open the Friern Barnet Library, unlikely; what will happen to Osidge Library after the election, who knows? Of much greater significance is the dogmatic and high risk One Barnet Outsourcing programme. This Billion pound gamble could cost Barnet a fortune. A similar project in Somerset has cost the Council £55 million according to its Conservative Leader Ken Maddock. Yet Barnet Conservatives seem convinced this is answer to all our problems irrespective of how badly it has gone elsewhere. Tomorrow in Brunswick Park it will boil down to a pro or anti council vote with Labour being the only party who can successfully represent the anti-council lobby. Let us hope that the voters of Brunswick Park use the vote and use it wisely! I have just returned from a very pleasant evening with some of the nicest people in Barnet. Tonight was an informal party to celebrate the demise of Mr Coleman hosted by Helen Michaels at Cafe Buzz in North Finchley. Parking activists, Friern Barnet Library campaigners, the enigmatic Mr Johny Baldy, author of the 101 reasons to sack Brian Coleman blog, along with some battle hardened activists were present. However, the one message that I overhead many times is that this isn't the end of the fight but merely the end of round one. 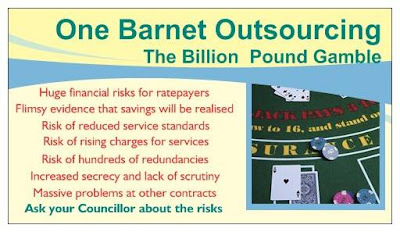 There are still a great many mistakes the council need to rectify, the attacks on the most vulnerable in the borough, the madness that is One Barnet Outsourcing. I came away with a real sense of the growing self empowerment of residents; they will no longer simply roll over when the council sets policy without meaningful consultation and consensus on the outcomes. I don't know if the Conservatives will be defeated in the forthcoming Brunswick Park By-Election but I suspect they will get a real run for their money. A regime that rules by diktat rather than consensus will inevitably be overturned. In the case of Barnet Conservatives that might happen in 2014 if they don't start changing now. It is interesting to see that the Council have made some positive noises about changing some of the mad parking policies. We will have to see what the parking review brings but I suspect it will be minor, the charges will still be sky high but we will be able to pay at a machine with a credit card. One area where I would like Barnet to reconsider is the whole One Barnet Outsourcing Programme. As I have said previously, I am not ideologically opposed to outsourcing. However the scale and complexity of the two main outsourcing contracts suggest to anyone with an ounce of common sense that this is an exceptionally risky venture. Last week I was speaking with a very nice chap who runs a multi million pound business. We got on to the subject of Barnet Council and I took the opportunity to ask him his views on the One Barnet programme. His initial view was, unsurprisingly, well there's nothing wrong with outsourcing. However, as I started to talk him through the huge scale of the One Barnet programme his mouth fell open. Yes they are going to outsource the entire finance department, IT department, HR department, planning department, Environmental health, Regeneration to name but a few. "Hang on a minute", he said "what about all the conflicts of interest that will arise". Yes he is right. With regeneration strategic planning, land charges and planning development management all being outsourced to the same company, this will inevitably create huge potential risks for conflicts of interest. We then talked about the length of the contract. "I guess they are going to let it for three years to see how it goes"? he asked. Oh dear he was in for another shock. Ten year minimum with the option to extend for a further five years. At this stage my acquaintance was choking a bit. Are they aware of the risks they are taking on - well frankly I don't think that most of the Councillors do understand the risks involved. The clincher was when I told him the budget for all the consultants advising the council is £9.2 million. How many disadvantaged people could that have helped? I am going to be speaking to as many local residents as possible and encourage them to ask their Councillors if they are aware of the level of risk they are exposing Barnet ratepayers to because ultimately it is the ratepayers who will pick up the bill if this all goes wrong. With Brian Coleman losing his grip on the Cabinet, now is definitely the time call a halt to this programme. Mr Reasonable has been indisposed for the last week or so but today I am back to blogging. Several matters have caught my eye over the intervening period, all of which are inextricably linked to a Conservative regime which is out of touch with the people it is supposed to represent. The first is the fun and games going on in the Brunswick Park Ward By-Election for which I am indebted to the Barnet Bugle for bringing to my attention. The Conservative candidate makes a series of claims including fighting against the introduction of parking charges in the local car parks and helping to relaunch Church Farm Youth Club. The fact that the conservative group voted repeatedly to introduce charges and that the conservatives withdrew funding from the Church Hill Road Youth Club seem to have passed her by. By claiming that she is not a politician simply a working mother is somewhat disingenuous given that she is the Executive Secretary of The Conservative Muslim Forum, an integral part of the Conservative Party. The second is the consultation on Door to Door Transport. This seems to be a very clear way of cutting services to the most vulnerable. Like so many consultations carried out by this administration, simply going through a process in order to impose a policy that no one supports is not what most reasonable people would classify as 'consultation'. The third matter relates to the railings outside Martins Primary School in East Finchley. Anyone with an ounce of common sense would have realised that this was a bonkers idea but the Council went ahead with it anyway. New person in charge, Cllr Dean Cohen realises its a mistake and agrees that the railing should be replaced. Ultimately the right decision but by not listening to local people in the first place this fruitless exercise will have cost the ratepayers of Barnet several thousand pounds. I genuinely hope that the voters in Brunswick Park send another signal to the Conservative group at Barnet council that they have got to change their ways and start actively and honestly engaging with residents. It seems to have had a small effect with Brian Coleman but there is still a great deal of change required. The Council needs to recognise that the residents of Barnet are its biggest asset. They have knowledge, they have skills, they contribute to their local community and ultimately it is the ratepayers who pick up the bill. Barnet needs to stop ignoring residents and start taking them seriously. Barnet bloggers' open letter to council leader Cornelius: Sack Brian Coleman! The people of Barnet have spoken. The London Assembly result on 3 May was a resounding rejection of the policies of your administration and of a prominent member of your leadership team. As you were not leader at the time of the 2010 election, and most of your unpopular polices were not part of the manifesto, we ask you to consider the following proposals, with a view to changing the course of your administration. 1. Dismiss Brian Coleman from your Cabinet. Mr Coleman was decisively rejected by Barnet voters in the London Assembly election and to allow him to continue in post is an insult. 2. Reopen Friern Barnet Library immediately. This well-supported community asset cannot be replaced successfully at the Artsdepot. 3. With local traders, campaigns and stakeholders, create a parking regime that will enhance the environment and restore the fortunes of Barnet’s high streets. Parking charges should manage traffic, not rake in cash. No more hikes in parking charges; reduce charges as necessary, including in CPZs. 4. Cut the rate paid to all freelance consultants employed by Barnet by 25%. Large city firms including JP Morgan and Lloyds TSB have instituted such a policy in response to the harsh economic times. Any consultant not prepared to take a cut would be terminated as per contract terms. 5. Cut the pay of all Barnet Council staff earning more than £150,000 p.a. by 20% and staff on £100,000 - £150,000 p.a. by 10%. The savings in 4. and 5. would generate far more than the sum lost through the parking changes above. 6. Immediately halt the One Barnet outsourcing programme. Dismiss all consultants engaged on the programme. 7. Invite the council trade unions to identify savings and efficiencies within Barnet Council, at the same time protecting services, jobs, and pay and conditions. This exercise should also be opened up to Councillors and members of the public. 8. Invite members of the public to form an oversight panel, to scrutinise contracts and accounts with suppliers. Give the panel access to all council contract information, subject to signing of confidentiality agreements. The panel would report directly to the chair of the audit committee. 9. Cut all councillor allowances by 10%, to show that we really are “all in this together”, and review the excessive allowances paid to Cabinet members and Committee chairs. Learn the lessons of the upset caused to voters by the "Allowancegate" scandal. 10. Stop harassing members of the public involved in protests against discredited council policies. Work with residents, not against them, to improve Barnet. Embrace democracy! In the year of the 100th anniversary of the Titanic, we ask: do you want to be the political equivalent of the captain who hit the iceberg? Barnet Council has had two years of unremitting bad press as a result of policies that were not declared to the public during the 2010 election. Now the people have spoken, and we the undersigned believe that you have no choice but to listen and to change course. I have just read a report by Barnet Unison which terrifies me and which illustrates how the current regime at Barnet Council are out of control. Barnet Council have used a consultant to come up with a scheme which restructures the Revenues and Benefits department. The consultant’s proposal fails to provide a detailed risk analysis to justify saving of £650k per annum when only 1% drop in income collection could expose the council to a loss of over £2.2 million in council tax collection just over £1.1 million in business rates. Our analysis shows that 0.2% drop in income collection will wipe out the proposed saving £650k. The consultant’s proposal neglects to address the risk to the Housing Benefit subsidy, currently at £260 million per annum reclaimed from the DWP. This is significant to the council as for example a loss of 1% in subsidy would equate to £2.6million. Currently Barnet performs in the top six in London at maximising the reclaim from the DWP. As their structure dramatically reduces expert resources the consultant report needs to include a specific risk analysis mitigating actions for realising set income targets. The consultant’s proposal will not enable the council to optimise its income and as a result could potentially result in unplanned future increases in council tax as result of non collection. The consultant’s proposal seeks to reduce the managers by 36% in the new structure for Revenues. This places undue burden on management’s capacity to deal with future planned legislative changes and therefore there is a risk to operational performance and meet set income targets. Additionally it leaves the council at risk to further change control charges by the contractor thus increasing the costs to Barnet and its residents. Financial and reputational risks to council from loss of specialist capacity, e.g. Court officer, NNDR, etc. It will no longer be possible to carry out all essential work, which will have a serious and far-reaching impact. The nationally published statistics provided by The Department for Communities and Local Government (DCLG) confirms that the consultants’ above statement is factually inaccurate. We have provided the official data from DCLG on page 3 of this report and a further breakdown in Appendix 2. Furthermore consultant’s conclusions have not been supported by meaningful benchmarking data and analysis. Any removal of key checks and balances, as suggested by the consultant’s report, will inevitably result in an increase in errors and deterioration in the detection and prevention of fraud. In this new fragmented business process the council will not be able to provide one stop quality experience to the customer. Transferring of calls and artificial tier creation will result in a duplication of effort and delays in responses. This will inevitably result in an increase in overall workload and inefficient processes as callers and email traffic will be passed from one department to another, as it is impossible to tell what tier the call or email is at the point of contact. Customer care standards will drop as a result of the transfer of most types of contact to the contact call centre. Currently near to 100% of calls are resolved at first point of contact. The contact call centre aims to achieve only 80%. This illustrates to me the drawbacks of using consultants without actually undertanding what they are proposing. It is a classic example of One Barnet Dogma - strategy for strategy's sake rather than focusing on how to deliver the service cost effectively and efficiently. This is yet another reason why Barnet Council needs to change and change quickly before they destroy this Borough. There were many smiling faces at the Friern Barnet pop up Library this morning. Along with bloggers Barnet Eye, Mr Mustard and Mrs Angry, and Green candidate Audrey Poppy were many people relieved in one way or another to see the back of Mr Coleman. The talk was all about his defeat in the GLA election and the scale of Andrew Dismore's victory. 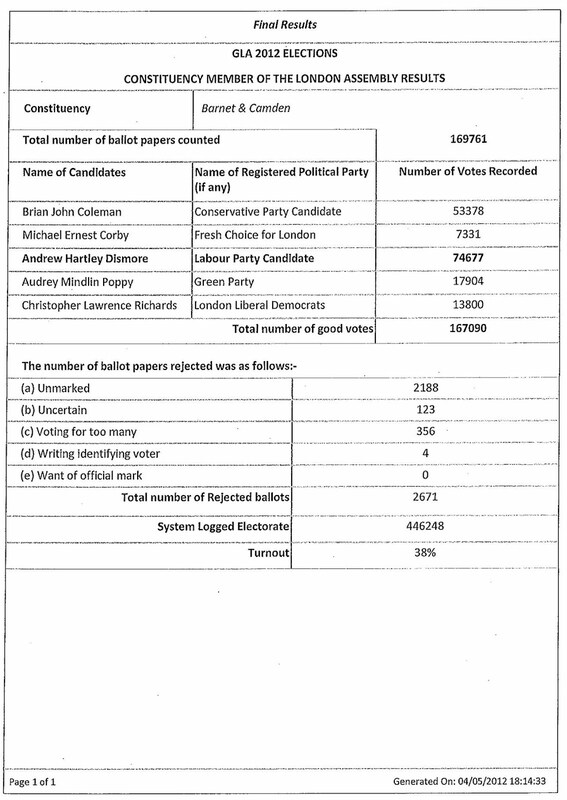 Mr Dismore got 44% of the vote compared to 31% for Mr Coleman. However Barnet & Camden residents voted 49% for Boris and 35% Ken so clearly people were not voting simply on party lines. This was a concerted effort to rid Barnet of one of its most disliked politician's - and it worked! Although I am pleased that Brian Coleman not longer represents us on the GLA he is still a cabinet member in Barnet and the Council continue to pursue their high risk strategy of One Barnet outsourcing, their uncaring Unfairer Contributions Policy, killing the high street with expensive pay by phone parking, closing libraries, private events in the parks to name but a few. The next election coming up is in Brunswick Park ward on Thursday 31 May. Barnet Council have 26 days to demonstrate that they have learned from Brain Coleman's rejection by the electorate and to start changing. If the Council try and fob off residents with a few concessions on parking charges residents may be force to teach them another lesson. Cllr Cornelius, please use this opportunity to re-exert your authority. Move Brian Coleman out of the cabinet away from his power base and start listening to the residents. Re-open Friern Barnet Library. Reverse the parking madness and give the shops a chance. Put a halt to the One Barnet Outsourcing programme, sack the consultants and hold an open forum to discuss how savings can be made in a way that minimises the impact on the most vulnerable. Failure to show residents you want to change will lead to you being rejected at the ballot box in 26 days time and again in 2014. Many said it couldn’t happen but Brian Coleman’s 19,693 majority has been overturned with a 21,299 majority for Andrew Dismore. Let’s also not forget that Oakleigh ward Councillor Sachin Rajput was also thrashed as he stood as a GLA candidate in Brent & Harrow. Barnet Council need to realise that this vote wasn’t just about the GLA . It was a clear signal on the Conservatives running of Barnet Council and the way they have raised two fingers to the residents. Today the residents of Barnet showed they have had enough. If Brian Coleman is vulnerable every single Conservative seat in Barnet is vulnerable. Richard Cornelius, now is your chance to stop and reconsider the barmy policies, the undemocratic practices, the uncaring and unfair treatment of the most vulnerable, the high handed and aloof attitude of senior officers. Stop being arrogant and start treating the public with respect. If you don’t change and quickly you will get kicked out in two years time. Empty Polling Station - For Goodness Sake Get Out and Vote! I have just returned from my local polling station which seemed rather like the Marie Celeste. No one else was there and apparently voting has been very slow. One thing that makes me really cross is people who moan about politicians but then don’t vote. Sadly I suspect that the apathy engendered by the GLA and mayoral elections has switched off many potential voters some of whom no longer see any point in voting. As DCMD put it in a comment on this blog yesterday "same meat different gravy". The Machiavellian in me suspects that actually the big parties really don’t mind when people become apathetic because they can do what they want with little or no opposition. This will reduce the health of our democracy to a point where we simply become passive consumers of a totalitarian state. It sounds a bit melodramatic but it is happening all around us. If people want to retain some control over how their lives are managed by the state then for goodness get out and exercise your democratic right – PLEASE VOTE! Tomorrow I will be voting for Andrew Dismore for GLA representative and Siobhan Benita for Mayor. I do not believe that Brian Coleman represents my views or best interests and in Barnet. He has shown himself to be disrespectful, uncaring and plain rude. He is a liability and makes Barnet look like a joke. Take a look at the website 101 reasons to sack Brian Coleman and that should make it clear. 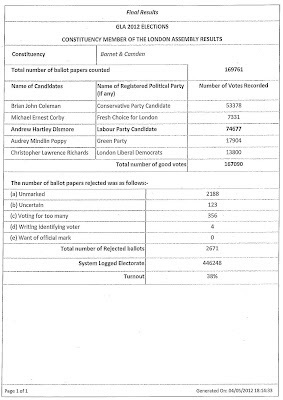 Andrew Dismore is the only person who can beat Brian Coleman and although I find Audrey Poppy of the Green Party engaging, sadly a vote for her will only help Coleman back in. As for Mayor frankly I am sick to death of both Ken and Boris and I think neither of them offers Londoners something new and original. I have followed Siobhan Benita’s progress and I find her intelligent, compelling and above all else, full of common sense, something which is in short supply currently. People may say that a vote for Siobhan Benita will be wasted - I do not believe that to be the case. My view is that if more voters sent a signal to the major parties telling them to stop sticking to the rigid party political dogma and start representing the vast majority of honest, hard working, ordinary Londoners we might actually end up with a system that works for us and not the crony hangers-on. For the London wide vote I will be voting Green to provide the GLA with a conscience. Please forgive the indulgence today, normal reasonable service will be resumed on Friday.